Put our vast experience to work for you! With over 30 years experience in the printing and advertising business, we take great care in getting to know our clients and realizing your individual printing needs then customizing our services to provide all your printing and advertising needs. 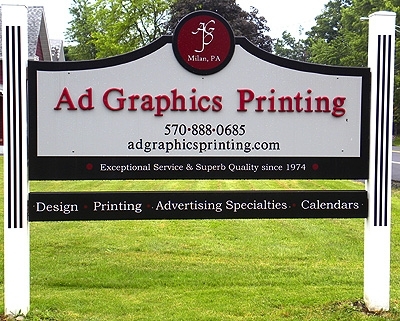 Ad Graphics Printing is located on Route 220 in Milan, PA, between Sayre, PA and Towanda, PA. We are just 4 miles south of Athens, PA and about 6 miles south of Waverly, NY.  Our central location is appealing to many businesses in the Valley, Towanda and surrounding areas making us one of the most conveniently located printing companies in the Twin Tiers. When you need promotional products, forms, calendars, labels, banners, apparel, or any other printing service, we will provide every aspect of your job from design to delivery.